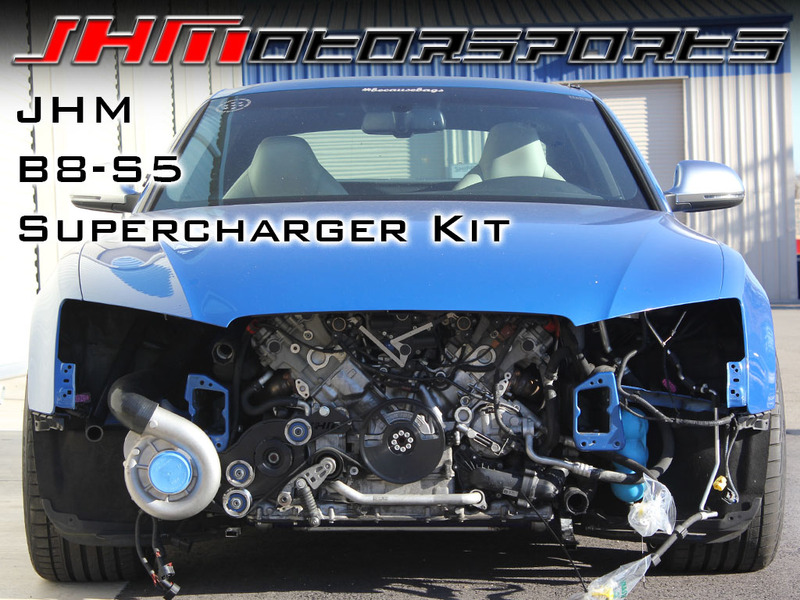 Introducing the JHMotorsports Stage 1 B8-S5 4.2L Supercharger Kit!!! NOW AVAILABLE FOR BOTH MANUAL AND TIPTRONIC (AUTOMATIC) TRANSMISSION S5s! 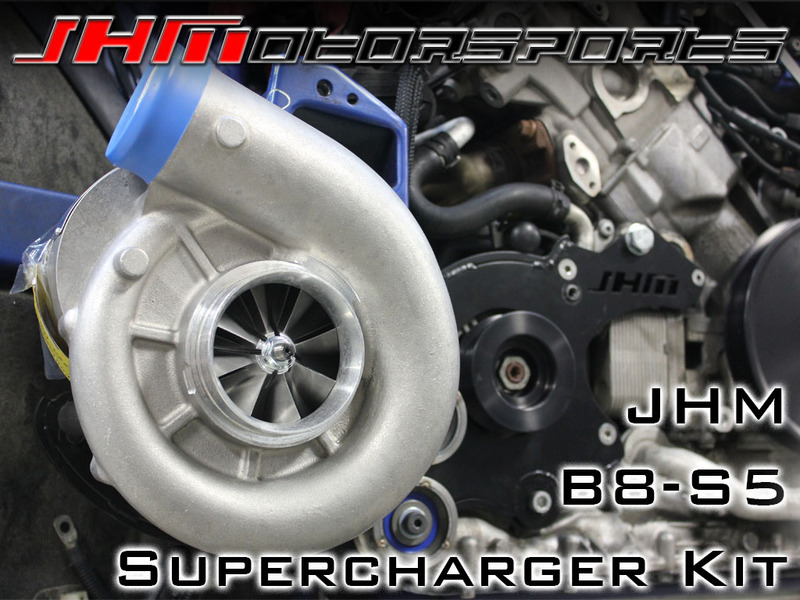 The JHM Stage 1 Supercharger is hands down the most cost effective supercharger solution for the B8-S5 4.2L. With common bolt-ons and supporting hardware, we have repeatably achieved high 11 second quarter mile runs, with 118MPH trap speeds!! With performance like that, your seemingly unsuspecting two door German coupe becomes a definite force to be reckoned with. 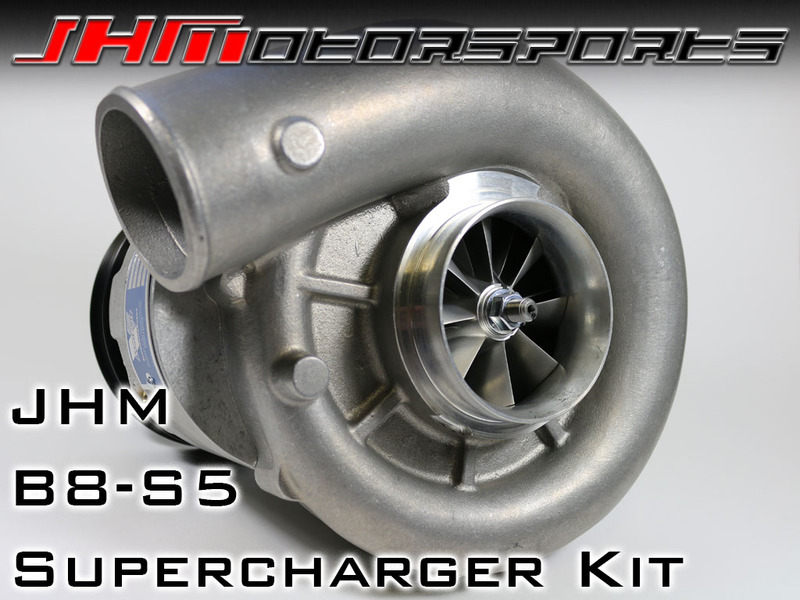 The JHM Stage 1 Supercharger Kit is the foundation for the different power levels that will be available for the B8-S5 4.2L. With the addition of a smaller pulley, an intercooler, fueling upgrades, or even a built motor along with our software upgrade, you can build off of the Stage 1 kit to meet your power output needs. This Stage 1 Kit features the same supercharger head unit that was on our in-house, record setting 2007 B7-RS4 4.2L FSI that ran an incredible 10.7 second quarter mile at 130 mph. That was at full weight, a complete interior, a complete exhaust system, and street tires! Our JHM Stage 1 Supercharger Kit for the B8-S5 4.2L will make 100-130 wheel horsepower (WHP) over your car's current configuration. Your current modifications, the dynamometer (dyno) used, temperature, elevation, and octane of gas will all effect the exact amount of power gains. Our Supercharger Kit features a Vortech V3 Si Centrifugal Supercharger Head Unit that is good for up to 800 horsepower! (Unchecked, this amount of power would be too much for a stock B8-S5 4.2L motor. Through our extensive development and testing process, we were able to limit the output of the supercharger to levels safe for the stock motor through hardware and tuning.) The V3 Si blower is a self-contained unit featuring quiet, helical cut gears. The only time you hear noise from the blower is at idle and low speeds. 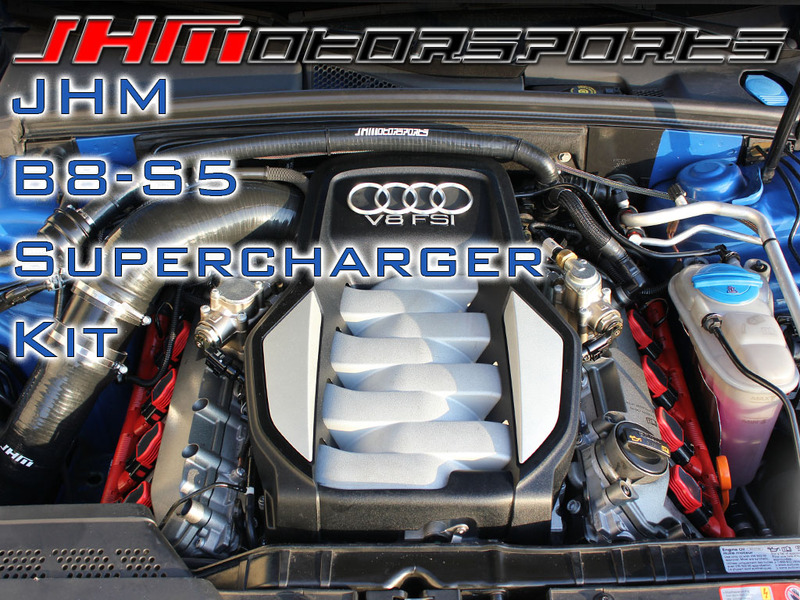 At wide open throttle, you hear nothing but the raw power coming from your JHM Supercharged S5. 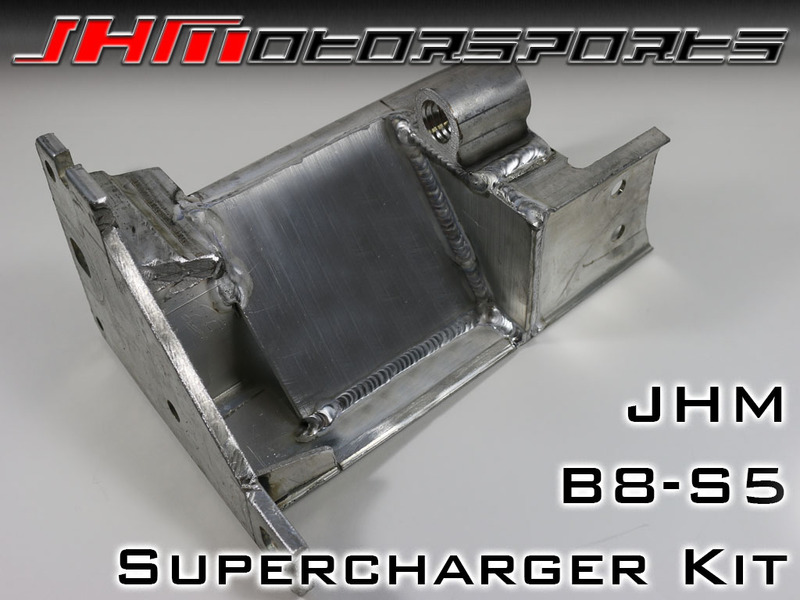 The JHM Stage 1 Supercharger Kit also includes our JHM Supercharger Mounting Brackets that were designed and are made in-house. These brackets are made from reinforced steel, laser cut, and then powder coated black for a clean installation. In order to insure the longevity and durability of the belt and pulleys on the S5, we upgraded the OEM belt and pulleys to a 6-rib system with our JHM 6-Rib Accessory Belt Conversion Kit. 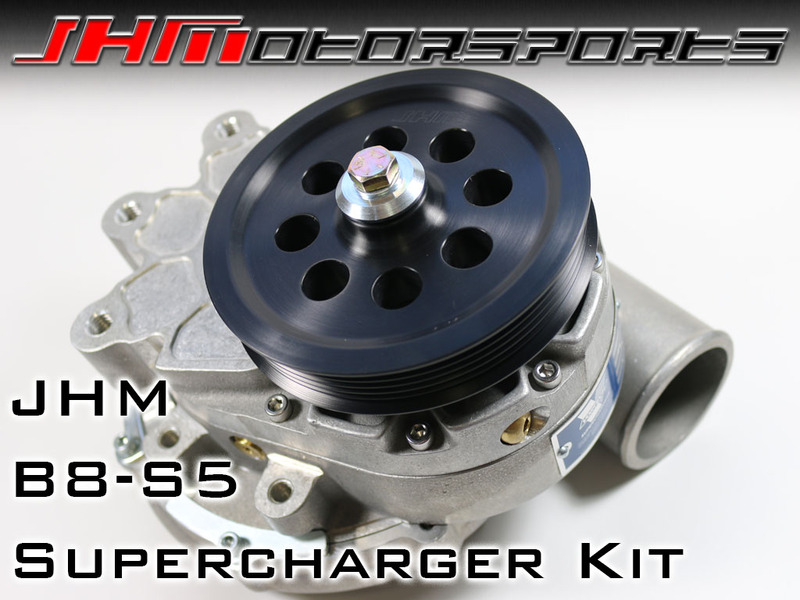 This Conversion Kit features 3 JHM Supercharger Kit specific pulleys including an Alternator Pulley, a precision balanced Crank Pulley, and a Supercharger Pulley good for 7 to 9 pounds of boost (exact boost levels will vary depending on your exhaust system, other modifications, and environmental factors). Due to the compact engine bay of the V8 S5, we had to locate the Vortech Supercharger Head Unit off of the passenger side of the motor, below the headlight. 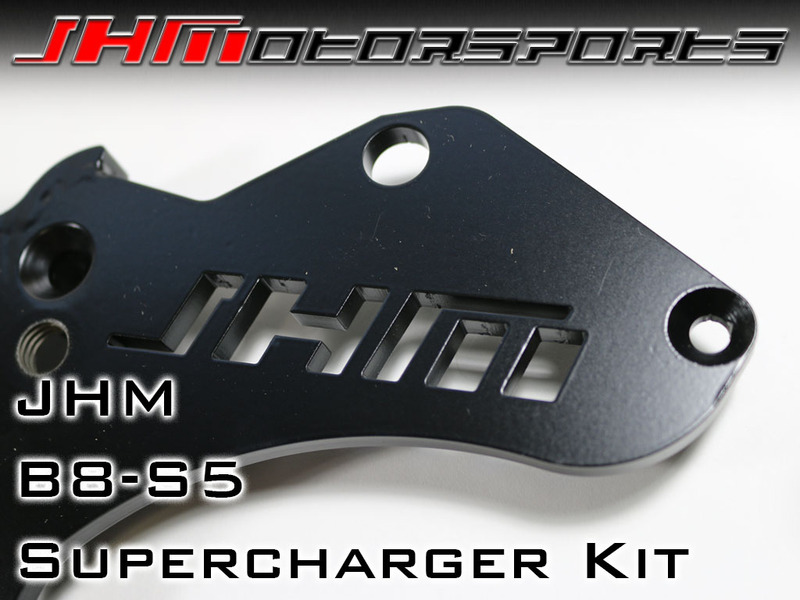 We created a number of different proprietary parts including our JHM Supercharger Kit Silicone Inlet and Outlet Hoses. The Inlet Hose is made from reinforced silicone to prevent collapse under vacuum. The air intake is filtered through a JHM Supercharger Kit specific K&N high-flow, conical air filter. Stage 2 is now available! 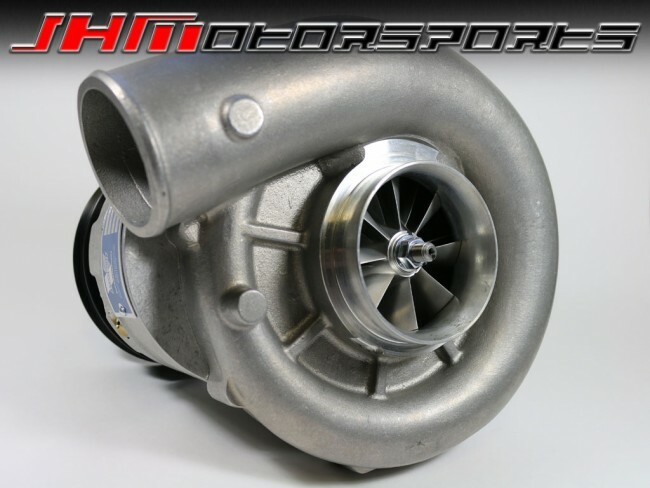 Here is an article from the Vortech Superchargers Blog regarding our kit for the B6-B7 S4 that uses the same Supercharger Unit! "JH Motorsports Uses Vortech Supercharged Boost to Rocket Their Audi S4 into the 11s..."
- Our JHM Stage 1 Supercharger kit fits all 2008-20012 B8-S5 4.2L - Early and Late Intake Manifold, Automatic and Manual Transmission. DOWNLOAD INSTRUCTIONS HERE -> JHM SC Kit Install pdf. NOTE: Average installation time is 12-14 hours. NOTE: Some clearancing of your vehicle is required to install the kit: Passenger frame rail mounting pad for bumper support bracket, bumper support bar on the back and core support. A pre-clearanced and reinforced passenger side bumper support bracket is included with this kit. NOTE: If you have Adaptive Cruise Control it will need to be deleted or relocated. We can sell you a relocation bracket upon request. Please contact us for more information. NOTE: We HIGHLY recommend new Coil Packs and Injectors (We stock both of these, go back one section to add them to your shopping cart) as well as performing a Carbon Cleaning during the installation of the supercharger for optimal performance. These cars are known to have Coil Pack and Injector failure once the vehicle gets over 60K Mile range. With FSI Engines, carbon buildup it is inevitable and if neglected too long can cause serious performance issues. - JHM 6-Rib Kit: If you have previously upgraded to the JHM 6-Rib Kit for your B8-S5 4.2L, we will credit you towards the cost of your JHM Stage 1 Supercharger Kit purchase. Select the option that applies to you and provide your Invoice/Order number from your JHM 6-Rib purchase in the Order Comments at checkout. - JHM Tuned: If you are already JHM Tuned and have our ECU Calibration for your B8-S5 4.2L, we will credit you towards the cost of your JHM Stage 1 Supercharger Kit purchase. Select the option that applies to you and provide your Invoice/Order number from your JHM Tuning purchase in the Order Comments at checkout. - Motor Mounts: 034Motorsport Density Line Motormounts are REQUIRED for the installation of this kit. This is because the OEM mounts are too soft and start to sag with age. - MAF Hose: 034Motorsport or other aftermarket MAF Hoses are required for the installation of this kit. This is because the OEM MAF Hose is not suitable for boost, and will expanding causing the MAF Hose to rub through the heat shielding material. - Flashing Method: With the new, JHM Flashing Server we now have the ability to flash our JHM Stage 1 Supercharger ECU Calibration to your car without removing the ECU. You can either have this done at your local JHM Flashing dealer (call us for a location near you) OR you can purchase a cable and perform the flash yourself. Select your preference using the dropdown below. - Country: In order to confirm that we have an ECU calibration for your specific box code, please select your S5's region (USA - Canada or Rest of World) from the dropdown below. - Year: In order to confirm that we have an ECU calibration for your specific box code, please select the year of your S5 (2008-2012) from the dropdown below. NOTE: Please provide us with your VIN# for our records and manifold confirmation. Off-road use ONLY: THIS PRODUCT IS FOR RACING COMPETITION ONLY AND IS NOT LEGAL FOR USE IN HIGHWAY OR STREET VEHICLES OR OTHER NON-RACING COMPETITION OFF-ROAD VEHICLES. BY PURCHASING THIS PRODUCT YOU ACKNOWLEDGE ITS INTENDED USE. I drove up Pikes Peak over the weekend and the supercharger worked flawlessly. It was a very smooth drive all the way from Kansas City, Missouri to Colorado, up Pikes Peak and back to Kansas City again. You all definitely have a reliable supercharger kit. Just thought I'd share.